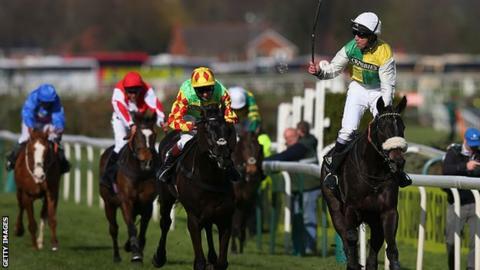 Many Clouds is a "worthy favourite" to win a second Grand National, says record-seeking jockey Leighton Aspell. The 2015 victor, trained by Oliver Sherwood, is rated an 8-1 chance to be the first horse to win back-to-back Nationals since Red Rum in the 1970s. "I would choose Many Clouds for his experience and class," said Aspell, 39. "He's possibly still improving." "So far, so good," he added. "His form this year is even better. He's a nine-year-old at his absolute peak." The rider lists dual Irish Hennessy Gold Cup winner Carlingford Lough and last season's Cheltenham Gold Cup fourth-placed finisher Holywell among the chief dangers for the big race at Aintree on 9 April. He was speaking as 96 horses remained at the latest entry stage for the £1m race, which sees runners negotiate 30 fences over a distance of more than four miles. With a maximum 40 allowed to run, handicapper Phil Smith said it was 50-50 whether Pineau De Re - currently number 50 - would make the cut.